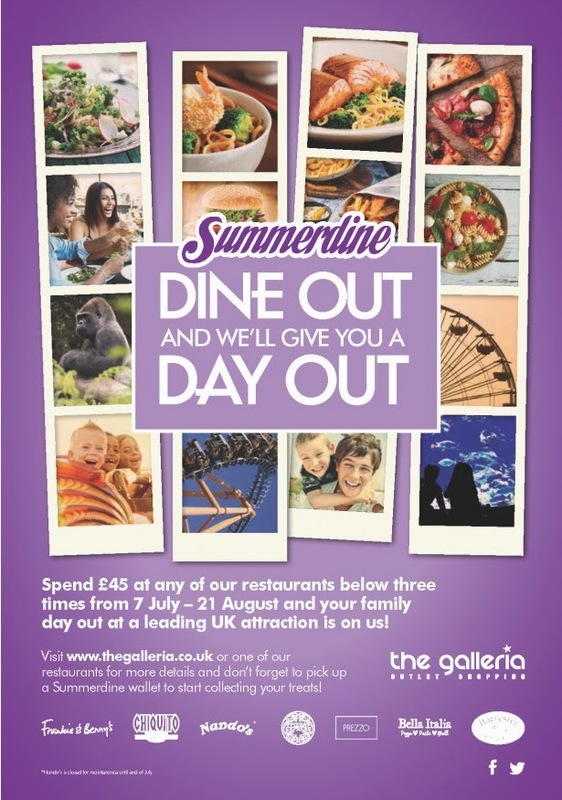 This summer, The Galleria in Hatfield have launched their Summerdine Promotion, which combines dining at the centre's restaurants over the summer, with some days out at top attractions including Legoland, Thorpe Park, Duxford Air Museum, Willows Farm and the Warner Bros Studio Tour. The promotion which runs from July 7th - August 21st features restaurants such as Pizza Express, Chiquito, Nando’s, Prezzo, Bella Italia, Frankie and Benny’s and Harvester. Families who dine three times and spend over £45 per visit during the six weeks of the Summerdine promotion, will receive a free day out the attraction of their choice for up to two adults and two children. 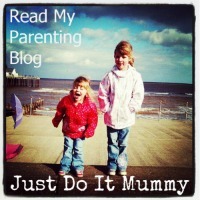 As a parent to two children, I know that days out to these attractions can sometimes be as much as £50 - £100 for a family, and so an opportunity to enjoy a family day out or free, as a reward for eating out with the kids can only be a good thing. The Galleria in Hatfield invited us to review the Summerdine Promotion, and enjoy a meal at Prezzo to see how the promotion worked. With the kids away with the grandparents, hubby and I took advantage of the offer, and spent the evening at Prezzo, enjoying a meal together. The restaurant was quite busy for a Monday evening, but when we entered, we were shown to a table very quickly and offered drinks. We started our evening with a bread board to share, which included tomato and pesto, mozzarella and garlic, and other breads with olive oil. Munching on our bread, we were able to peruse the menu at our leisure. 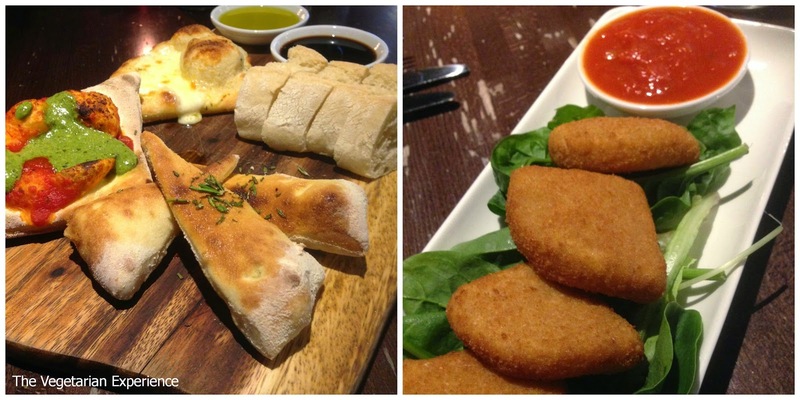 Being an Italian restaurant, there is a wide selection of Pizza and Pasta on offer, along with Grills and Salads. The choice for Vegetarians included quite a few pizza choices, and two pasta choices with one salad and one risotto option. I would say that there was a pretty good selection for Vegetarians to choose from, and I didn't have trouble finding something to order. For starters, I opted for Mozzarella in Carrozza (mozzarella in breadcrumbs served with a pomodoro sauce), which is a firm veggie favourite of mine. When it arrived, soon after ordering, there was a good portion which was very filling and tasted extremely delicious. For main course, I chose the Goats Cheese Al Forno which consisted of field mushrooms, roasted peppers, baby spinach and fusilli in tomato sauce drizzled with basil pesto. As you can see from the photo, it was a big portion and very filling. It was so filling that I had to leave some, but it was definitely very tasty and satisfying. I also ordered the warm potato salad which had an interesting lemon and mustard dressing. Hubby had the Calzone, which was stuffed full of filling, and which he very much enjoyed too. As the photos indicate, all of the ingredients used were fresh and the meals were cooked from scratch. We ended our meal with a dessert. 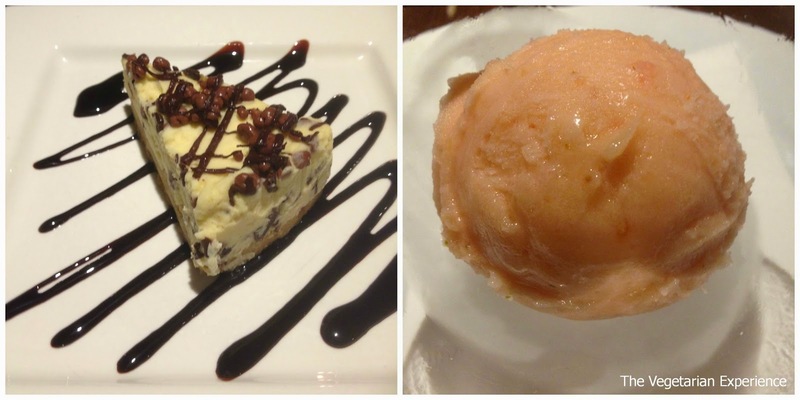 Hubby opted for Honeycomb Smash Cheesecake, and I opted for the Pimm's Sorbet. The cheesecake was very filling and a good end to the meal, and the Pimm;s Sorbet was absolutely sublime, and finished off my meal very well. I would definitely recommend a visit to Prezzo. The menu is very reasonably priced, the food was delicious, the restaurant had great decor and was very atmospheric. We especially loved the open pizza oven where you could see the food being prepared. The service was excellent, the waiting staff were very attentive and gave really good service, including clearing the table between meals and offering more drinks. I was very impressed with the service. I was also very impressed with the food, which was fresh, hot and served in ample portions. The meal was very reasonably priced. It's always good to get rewarded for eating out, so if you haven't done so already, I would definitely recommend checking out the Summerdine Promotion at The Galleria. Check out the terms and conditions of the Summerdine promotion, and do consider enjoying a free day out for you and your family or friends. Disclosure: Free meal offered in consideration for review. All opinions are my own.